Teach your students about the fifty states with the Play Rugs! After young children learn about the alphabet and numbers, one of the first subjects that follow entails teaching them about the fifty states. 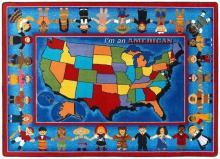 We have designed brilliantly colored Play Rugs that display each state in colors such as green, red, orange, and blue. 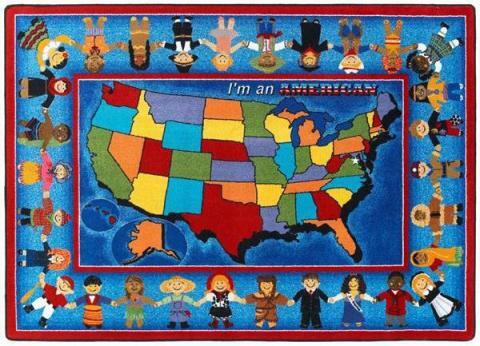 This stunning carpet is the perfect tool to teach geography, while delivering information that is unique for each state. With nine different sizes and two shapes to choose from, you will be able to find a carpet that corresponds with your classroom size. Your young students will comfortable sit on this carpet, as they begin to recognize the fifty states. We construct the Play Rugs with SoftFlex®, which is an air-texturized, polypropylene, secondary back. The tightly woven fibers ensure durable support and protection from extremely hot or cold floors. The most rambunctious students will not tear fibers from the rug or create large wrinkles. Our antimicrobial treatment prevents harmful mold and mildew from collecting in a humid classroom environment. The durability and fade resistance of the Play Rugs will give you years of educational use.